The start of the current Flevo Berry breeding program was in 1999 within the strawberry plant nursery Flevoplant. At that time there was no fit between the demand of the fruit growers and the available strawberry varieties. This led to the decision to invest in an own breeding program under the supervision of breeder Marcel Suiker. 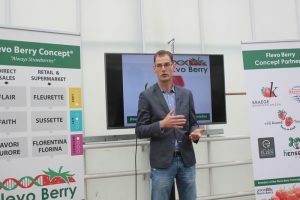 Nowadays Flevo Berry is a specialised independent breeding company with an unique range of varieties. Focus from the start was on day-neutral varieties and early- and late short-day varieties to be able to extend the strawberry season. Taste has always been the key criteria within the program. After 8 years of breeding, breeder Marcel Suiker could present his first variety; Flair, a very early short day variety. More varieties in the early-, late-, and day-neutral segment were introduced afterwards. Because of the success of the breeding program it was decided, in 2015, to further build the program in a separate organization; Flevo Berry. To be able to fulfil the growing demand for plants of our varieties, we work with licensed Flevo Berry-Concept Partners and licensed Flevo Berry Variety Partners all over the world. The Flevo Berry concept® holds a unique range of great tasting strawberry selections which are similar in appearance but different in season. This makes it possible for fruit growers to deliver high quality strawberry to the consumer the whole year through. Consumers can find our strawberry varieties at local farm shops and retail outlets throughout the world.